The benefits of using new breeding techniques for alfalfa improvement are just being developed. These GMO alfalfa varieties will revolutionize the using and management of alfalfa. This paper presents information on the development of two GMO alfalfa traits (Roundup Ready and Low Lignin Alfalfa) that will provide new tools for many farmers. It will mention some other research/development being conducted. Forage Genetics International began developing Roundup Ready alfalfa in 1994. The inserted gene produced the same protein as found in other roundup ready crops on the market. In conventional plants, glyphosate binds to an enzyme, blocking the biosynthesis of aromatic amino acids and depriving the plant of essential components (Haslam, 1993; Steinrucken and Amrheim, 1980). The RR plants are similar to non GMO plants but has a greatly reduced affinity for glyphosate (Padgette et al., 1995). Commercialized RR alfalfa varieties use two independent events (J101 and J163) combined through a commercial breeding process (Samac et al., 2004). Alfalfa varieties are heterogeneous populations with individual plants being phenotypically and genotypically unique. The populations of alfalfa plants in commercial Roundup Ready varieties consist of individual plants with zero to eight copies of the cp4 epsps gene insert, contributed by either event J101 or J163. The Roundup Ready phenotype is exhibited if one or more copies of the RR gene are present in the plant. While useful to all farmers, RR alfalfa provides great benefit to the grower where weed control has been an issue in the production of alfalfa. First, glyphosate does not injure alfalfa as the most commonly used pre- and post-planting herbicides do. Further, imazethapyr has risk of yield loss with the crop following alfalfa when flax, corn, meadow bromegrass, oriental mustard, sunflower, timothy and wheat were seeded 1 year after herbicide application to the alfalfa, canola seeded up to 2 years later, and sugarbeet and potato seeded up to 3 years later (Moyer and Easu, 1996). Glyphosate can be used on RR alfalfa at very high rates with no detectible crop injury. Multiple studies by the senior author have shown an average yield reduction of 0.2 t/a for the cutting following imazethapyr or imazamox application to alfalfa compared to glyphosate. Another advantage of RR alfalfa is that glyphosate can be applied over a wider time window for effective weed control so that weather delays are less of an issue. Most other post emergent herbicides need to be applied when weeds are small, requiring greater rates and being less effective on larger weeds. Glyphosate controls a wider range of weeds than most other herbicides for alfalfa. One of the benefits of RR alfalfa will be the ability to use glyphosate to get much better control of winter annuals such as chickweed, wild garlic, wild onion, perennials such as dandelion, difficult weeds such as nutsedge and dodder, and poisonous weeds such as groundsel. All have been difficult to control, in some cases, limited to dormant herbicide applications so that control was not an option when the problem was visible. Further dormant herbicides are discriminated against in northern regions because, if winterkill occurs, no crop can be planted in the field during the following growing season. Another advantage of the RR alfalfa system is safety. Glyphosate is among the safest pesticide used on farms. It has an extremely low acute toxicity (the oral LD50 in the rat of pure glyphosate is 4,230 mg/kg, or 5,600 mg/). In fact, some of the surfactants mixed with glyphosate are more toxic than the herbicide. Glyphosate is inactivated when it comes into contact with soil since it is adsorbed onto soil particles in the same way as inorganic phosphates. Unbound glyphosate is rapidly degraded by microbial activity to carbon dioxide. Because of its adsorption to soil, glyphosate is not easily leached and is unlikely to contaminate ground water (Giesy et al., 2000) unlike certain other herbicides used on alfalfa (e.g., Velpar). Lastly there is a significant ease of use factor with glyphosate on RR crops since is not a restricted pesticide so growers do not need pesticide applicator certification to apply this compound. Also, many farmers growing corn or soybeans will already be using glyphosate. Therefore, they will not need separate herbicide storage or record keeping; they will not need to clean the sprayer or change nozzles when moving from one crop to another. There will also be less risk of drift onto a susceptible crop or the potential for spraying the wrong herbicide onto a susceptible crop. Glyphosate resistance has been reported in approximately a dozen weeds (Boerboom and Owen, 2006; https://www.extension.purdue.edu/extmedia/gwc/gwc-1.pdf). Some have been concerned that alfalfa as the third crop in the corn-soybean-alfalfa rotation of many dairy farmers would increase the rate of resistance development in weeds. However, including a forage crop in rotation with row crops will generally enhance weed control because some weeds cannot tolerate the frequent defoliation of a forage crop (Martin et al., 1967). It is believed that inclusion of alfalfa in corn-soybean rotations will be another tool to slow development of weed resistance to glyphosate. Thus the key to minimizing development of resistant weed populations and weed shifts will be the recommended stewardship of using multiple herbicides in rotational systems combined multiple mechanical controls such as preplant tillage and frequent mowing of alfalfa. Lignin provides strength to plants and allows the plant vascular system to transport water in the plant without leakage. Lignin increases with advanced maturity in alfalfa. However lignin is indigestible and reduces fiber digestibility in ruminants. Thus reducing lignin content should increase fiber digestibility at any maturity stage. Lignin is composed of three monomers, each a carbon ring with differing methoxy group configuration and a 3-carbon tail (Fig. 1). These subunits polymerize into lignin. This lignin molecule fills the spaces between cellulose, hemi-cellulose and pectins as the plant ages and binds with the hemicellulose. Lignin coating the cellulose allows water to move up the plant stem without leakage but also reduces digestion of the cellulose in the rumen. Thus some lignin is necessary but lignin above the minimum reduced fiber digestibility without additional benefit to the plant. We have tested transgenic alfalfa lines down-regulated for two lignin biosynthetic genes (COMT and CCOMT). Alfalfa populations for this study consisted of transgenic alfalfa lines down-regulated for one of two lignin biosynthetic genes, their null isogenic lines, and a check variety (LegenDairy 5.0). Replicated studies were conducted at Becker, MN; Arlington, WI; West Salem, WI and Davis, CA and Tulelake, CA. Plants were started in the greenhouse and then transplanted into the field in spring 2008 into rows spaced 30 cm apart with 30 cm between rows. Each plot consisted of three rows of 9 plants. The middle 7 plants of the middle row were harvested for yield and quality in summer 2008. 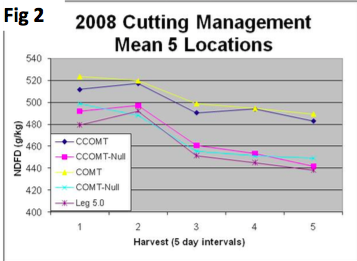 Harvests were taken beginning at late vegetative stage and continued at 5 day intervals for 5 total harvests. Forage samples were analyzed for crude protein (CP), neutral detergent fiber (NDF), acid detergent lignin (ADL), and neutral detergent fiber digestibility (NDFD) (in vitro 48 hr) and Relative Forage Quality (RFQ) was calculated. Proof of concept trials were conducted (separately from this study) where lignin transgenic alfalfa hay fed to rapidly growing lambs (Table 1)or in total mixed diets with corn silage to lactating dairy cows measured increased fiber digestibility and (Table 2). In the lamb trial, while NDF was not significantly different, both intake and NDFD of the COMT line was increased over its null (active) control. CCOMT did not show any significant responses. 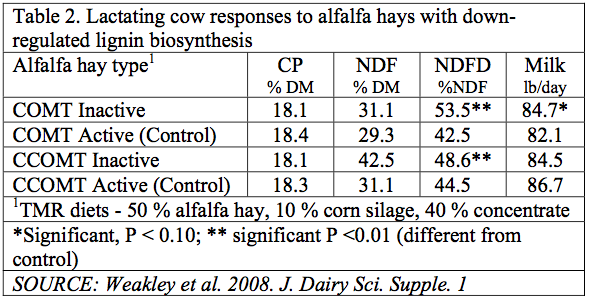 In the study with dairy cattle, digestible dry matter of COMT alfalfa increased 3.5% fat corrected milk over it’s null (active) line by 2.6 lb/hd/day (Table 2). Alfalfa stems from reduced lignin genotypes increased sugar yield which potentially could increase ethanol > 50% compared to standard alfalfa. In the current study, the null lines and the check variety (LegenDairy 5.0) had similar fiber digestibility which gradually declined as maturity advanced (later harvest date). Both low lignin lines had consistently higher fiber digestibility at each harvest date (Fig. 3). The CCOMT line averaged 12 percentage units less ADL than the null and had 10.2 percentage units more NDFD. The COMT line averaged 3.7 percentage units less ADL than the null and 14.0 percentage units more NDFD. A change in lignin composition in the COMT population is a likely explanation for the increased fiber digestibility relative to lignin content. Thus it will be possible to harvest higher quality with either of the transgenic alfalfa lines down-regulated for lignin synthesis when harvesting occurs on a similar schedule as for non-transgenic lines. Another way to view this data is that COMT and CCOMT lines harvested 8 to 12 days later than the nulls or commercial check had the same forage quality. Later harvesting will allow for higher yield per cutting (Fig. 3). When alfalfa begins to regrow after being cut, the growth per acre is low (perhaps less than 50 lb/acre/day) but as the crop matures the growth per day increases (to 200 lb/acre/day or more at harvest). 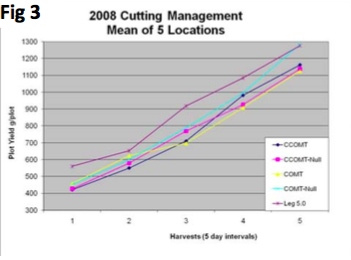 Thus, in alfalfa harvest systems where we took 3 vs 4 cuttings within the same time period, alfalfa yield was 20 to 30% greater (with the labor of one less cutting) for the 3-cut system. In the past the quality of the 3-cut system was much lower; now it may be possible to delay harvest to get the higher yield with the same forage quality as from standard alfalfa varieties cut earlier. I believe that this will be the most important aspect of this transgenic reduced lignin alfalfa, rather than higher quality forage harvested at the same date. The CCOMT line stood (lack of lodging) as well in space plantings at the commercial alfalfa line. COMT is an artificially created mutation for the same gene as bm3 which is a naturally occurring reduced lignin gene in corn. We did see some standability issues with this line. However, further breeding efforts may be able to solve this problem. Increased by pass protein of alfalfa. Alfalfa has a high protein content but most of it is soluble (degraded in the rumen), especially when alfalfa is made into silage. As such the protein may need to be supplemented with bypass protein in dairy rations, resulting in extra expense to the dairyman and increased methane loss to the atmosphere. Sullivan and Hatfield (2006) showed that red clover red clover (Trifolium pratense L.) has up to 90% less proteolysis during ensiling. They found that the combination of polyphenol oxidase (PPO) and o-diphenol PPO substrates, both abundantly present in red clover, is responsible for postharvest proteolytic inhibition in this forage crop. This gene has been transferred to from red clover to reduce the bypass protein of alfalfa. It may also reduce bloat problems. Another approach has been Similar attempts shave been made to identify genes that regulate the expression of sulfur amino acid-rich, ruminal degradation-resistant proteins and to transfer these genes into alfalfa. A GMO trait is available that enhances leaf retention through the later stages of growth and the harvesting process. Since the bulk of the nutrients are in the leaves such a trait could have significant economic benefit to farmers. Several GMO traits have been identified for drought resistant in alfalfa. These traits could be of great benefit in drought or where water is limiting. Some traits may also increase the dry matter produced per unit of water used (water use efficiency). A GMO trait for with delayed flowering has been identified that may allow alfalfa to be harvested later resulting in higher total season yield and possible reducing the number of cuttings taken per season. Boerboom, C., and M. Owen. 2006. Facts about glyphosate-resistant weeds. Purdue Extension GWC-1. Giesy, J.P, S. Dobson, and K.R. Solomon. 2000. Ecotoxological risk assessment for Roundup Herbicide. Rev of Env. Contam. Tox. 167:35-120. Haslam, E. 1993. Shikimic Acid: Metabolism and Metabolites; John Wiley and Sons: Chichester, England. Marita, J.M., J. Ralph, R.D. Hatfield, D. Guo, F. Chen, and R.A. Dixon. 2003. Structural and compositional modifications in lignin of transgenic alfalfa down-regulated in caffeic acid 3-O-methyltransferase and caffeoyl coenzyme A 3-O-methyltransferase. 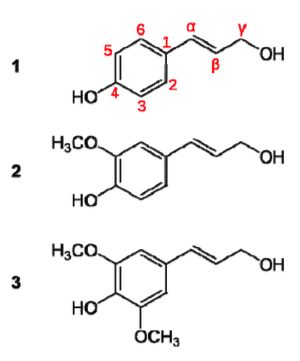 Phytochemistry 62(1): 53-65. Mertens, D.R., and M. McCaslin. 2008. Evaluation of alfalfa hays with down- regulated lignin biosynthesis. J.Dairy Sci. Vol. 91(Supplement 1). Martin, J.H., W.H. Leonard, and D.L. Stamp. 1967. Fertilizer, green manuring, and rotation practices. p166-172. In Principles of field crop production. MacMillam Publ. Co. Inc. New York. Moyer, J.R., and R Esau. 1996. Imidazolinone herbicide effects on following rotational crops in southern Alberta. Weed Technol. 10(1):100-106. Padgette, S.R., K.H. Kolacz, X. Delannay, D.B. Re, B.J. LaVallee, C.N. Tinius, W.K. Rhodes, Y.I. Otero, G.F. Barry, D.A. Eichholtz, V.M. Peschke, D.L. Nida, N.B. Taylor, and G.M. Kishore. 1995. Development, identification, and characterization of a glyphosate-tolerant soybean line. Crop Sci. 35:1451-1461. Samac, D.A., and S.J Temple. 2004. Development and utilization of transformation in Medicago species. In G.H. Liang and G.H. Skinner (ed.) Genetic transformation in crops; Haworth Press Inc.: Binghamton, New York. Sullivan, M.L., and R.D. Hatfield. 2006. Polyphenol oxidase and o-diphenols inhibit postharvest proteolysis in red clover and alfalfa. Crop Sci. 46:662-670. Undersander, D., N. Martin, M. Hall, and S. Mueller. 2009. Review of Roundup Ready alfalfa. Forage and Grazinglands. http://www.plantmanagementnetwork.org. Undersander, D., M. McCaslin, C. Sheaffer, D. Whalen, D. Miller, D. Putnam, and S. Orloff. 2010. Low lignin alfalfa redefining the yield quality tradeoff. In Proc., 2009 Western Alfalfa & Forage Conference, 2-4 Dec. 2009, Reno, NV. Weakley, D., D.R. Mertens and M. McCaslin. 2008. Lactating cow responses to alfalfa hays with down- regulated lignin biosynthesis. J. Dairy Sci. Vol. 91(Supplement 1).